4 Amazing Plug-ins featuring the BBE Sound legendary tone. For registered users of Sonic Sweet version 3, there is a FREE upgrade on the BBE Download Page. It has been built from the ground up within a new framework that brings the classic sound of BBE Sound into the future. The Sonic Sweet v4 is a FREE update for all registered Sonic Sweet v3 owners. 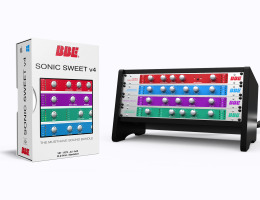 The BBE Sonic Sweet v4 plug-ins gives you exactly the same brightness, clarity, and fullness as the hardware modules with the added bonus of being fully automatisable. The “Sonic Sweet” bundle consists of four amazing plug-ins that bring the legendary BBE Sound into your productions. Professional musicians and studio engineers for years have known that the Sonic Maximizer is the best way to get that professional sound and extra sparkle that is so difficult to capture. Now you can access BBE processing technology within the digital domain. The D82 Sonic Maximizer plugin is identical to the physical unit it terms of utility and processing. The BBE advanced sonic processing technology and proprietary algorithms have allowed us to create a plugin that boasts outstanding features. High quality signal processing algorithms. Stereo Low Contour control (0 to 10). Stereo Process control (0 to 10). Output Level control variable from -12dB to +12dB. Full Automation for all parameters PC and Mac OS X. The BBE Sound Harmonic Maximizer increases Presence and Clarity, restores Natural Brightness and adds Deeper and Extended Low Frequencies. It can be used in the studio on individual tracks or an entire mix, or live to enhance the sound of a P.A. system. The BBE advanced sonic processing technology and proprietary algorithms have allowed us to create the H82 Harmonic Maximizer plugin that includes the following features. Lo Tune : adjusts the Bass Enhancement Frequency (40Hz to 150Hz). Lo Mix : adjusts the amount of Bass Enhancement and Subharmonics (0 to 10). Hi Tune : adjusts the frequency of the High Frequency (554Hz to 5.6kHz). Hi Mix : adjusts the amount of High Frequency and Stereo Enhancement (0 to 10). The Loudness Maximizer is a mixing and mastering multi-band limiter plug-in. Its ultimate transparency allows the Loudness Maximizer to 'dramatically' increase the overall level of your mix without audible pumping effects. Use simple controls, turning the Sensitivity, to increase the level of your overall mix without clipping or overloading. Sensitivity : adjusts the overall louder mix. Release : release time (0.01 to 1000 ms). Output Level control (Ceiling) : sets the maximum output ceiling level. As a new addition to the Sonic Sweet lineup, Mach 3 Bass will take your low end to new sonic depths. Insert this plug-in on any type off bass instrument or signal where you need a big boost on the low end. Mach 3 Bass allows you to easily dial in the frequency you want to accentuate and "bump the bass". Mach 3 Bass: adjusts the level of the low end. Freq Set: allows you to dial in the frequency of Mach 3. Bass Response: adjusts the responsiveness to the input signal. Protect: built in signal limiter. NO iLok OR eLicenser DONGLE REQUIRED ! BBE Sound Plug-in downloads are available from the "BBE Download Page".